On 16-Sep-2013, Ryanair announced a 10 year agreement with Manchester Airport Group (MAG), the new owner of Stansted Airport, to add more than 50% to its 2012 traffic base of 13.2 million passengers and carry more than 20 million passengers per annum at the airport. Ryanair CEO Michael O’Leary sounded very happy with the change of management at Stansted, where tariff increases under the previous owner led to a 27% fall in total passenger numbers from 2007 to 2012: “This agreement… proves how UK airports can flourish when released from the dead hand of the BAA monopoly and is the first dramatic initiative by MAG to reverse 7 years of decline”. In this report, we examine the relationship between Ryanair, which is Stansted’s largest airline, and Stansted, which is Ryanair’s largest airport. In a separate report, we will look at recent indications by Ryanair that it wants to be more customer friendly and consider how this fits in with its passenger growth targets. In return for returning to passenger growth at Stansted, Ryanair will receive lower costs and what it calls “more efficient facilities”. MAG is investing GBP80 million in the terminal at Stansted, but it is not yet clear how Ryanair will see this translate into benefits to its business. All Ryanair passengers are required to check in on-line and only around a quarter of its passengers bring a bag to check in. This means that Ryanair needs less terminal space than other carriers for check in and other activities, and less space than it used to need itself. Moreover, the reduction in passenger numbers over recent years has also made passing through Stansted a less crowded experience than it was in the past. Nevertheless, incremental improvements to processes such as baggage handling, security screening and to passenger handling at the departure gates could all improve the passenger experience at Stansted. The deal seems to make commercial sense for Stansted, although we cannot reach a definitive view on this without access to details of the agreement. Between 2007 and 2012, Stansted’s total revenues were flat at GBP242 million, while its operating profit fell by 70% from GBP77 million in 2007 to GBP23 million in 2012. Tariff increases sanctioned by the airport’s economic regulator (the Civil Aviation Authority) meant that average aeronautical income per passenger increased by 43% over the same period, although tariff increases had begun a year earlier and average aeronautical income per passenger increased by 130% from 2006 to 2012. This was the direct cause of a 26% fall in passenger numbers from 23.8 million in 2007 to 17.5 million in 2012. Ryanair is by far the biggest carrier at Stansted and its decision to cut capacity as a result of increased charges clearly contributed to the loss of traffic suffered by the airport. Ryanair does not report its passenger numbers by airport, but data from the slot coordinator for the UK, Airport Coordination Limited, show that it cut its seat numbers at Stansted by 21% from summer 2007 to summer 2013. If we assume that Ryanair’s passenger numbers at Stansted fell at a similar rate as its seat numbers, this suggests that it flew around 16.7 million passengers from the airport in 2007, but this dropped by 3.5 million between 2007 and 2012. Total seat numbers for all airlines at Stansted have fallen even more rapidly, by 36% from summer 2007 to summer 2013. In addition, we can deduce from the more rapid fall in total seats compared with passenger numbers at Stansted from 2007 to 2012 that average airline load factor increased over the period, probably also helped by the fact that the capacity cuts of Ryanair, a high load factor carrier, were less than those for all airlines at Stansted. Ryanair made a lot of noise about Stansted’s tariff increases and punished the airport with capacity cuts, but it was more lenient in this respect than other airlines. At its largest base, it did not want to cut off its nose to spite its face. As a result of cutting less rapidly than other airlines, Ryanair continued to grow its share of seats and air transport movements (ATMs) at Stansted throughout this period. This further underlined its position as the airport’s number one airline, with 74.7% of seats and 64.9% of ATMs at the start of summer 2013. Moreover, with 189 seats per ATM, each Ryanair flight brings more passengers to the airport than the average flight of the airport’s other airlines, which have only 157 seats per ATM. For Stansted to return to growth, it needed Ryanair to grow there once more and the only way to achieve that was to lower its fees. While lower fees will dilute Stansted’s aeronautical yield per passenger, the price elasticity of demand for air travel will stimulate passenger numbers as Ryanair will also lower its fares. In addition, Stansted will continue to receive the benefit of retail sales and its net retail income per passenger will be unaffected. This should mean that a cut in airport fees should lead to rising passenger numbers and increased revenues for Stansted. In a largely fixed cost business, and particularly one where incremental passenger handling costs are very low, this should drive higher profits for Stansted. Unequal relationship - who needs who the most? 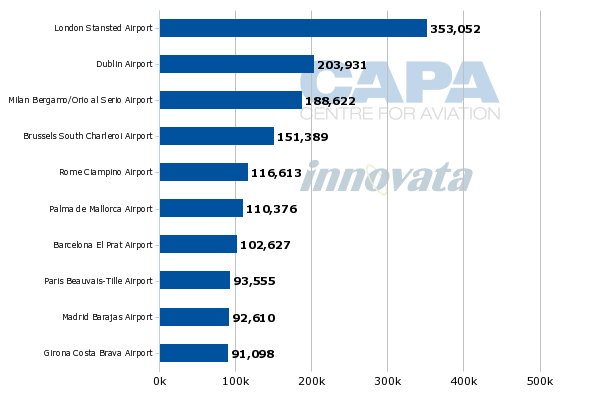 Stansted is Ryanair’s biggest airport, accounting for 8% of its seats (week of 23-Sep-2013, source: CAPA and Innovata) and is, therefore, important to Ryanair. Nevertheless, Ryanair has demonstrated that it could continue to grow its total traffic across its network while cutting back its operations at Stansted. While Stansted was seeing passenger numbers fall by 27% over five years, Ryanair enjoyed growth of 56%. The relationship between the two is important in both directions, but their relative growth paths and the share that each represents of the other’s business are not equal. It would seem that Stansted needs Ryanair more than Ryanair needs Stansted. Are the passenger targets in the agreement realistic? Neither Ryanair nor MAG has disclosed full details of the traffic targets and discounts under the agreement, but Stansted will only provide reduced fees to Ryanair if it meets targets on passenger numbers. This will focus Ryanair on offering attractive fares and allocating sufficient capacity to Stansted. “We will be cutting our average fares to deliver this”, says Mr O’Leary. This approach is not new for Ryanair: It has always run its business by setting passenger targets and then adjusting fares accordingly to meet those targets. It will need to move some capacity away from elsewhere in Europe and this should strengthen its hand in negotiations with other airports as it remains one of only a few airlines that can deliver passenger growth. Whether Ryanair’s traditional approach can now be followed profitably at Stansted – i.e. without having to lower fares below cost – depends on the exact passenger targets and discounts in the agreement and the strength of demand over the 10 year period. It expects traffic in the first year of the deal to be 14.5 million, but targets thereafter are a less clear (although MAG has provided a little more detail – see below). Ryanair has a five year plan to reach a total of 110 million passengers across its network in FY2019, an increase of 29 million from 81 million in FY2014. It now says that it expects the Stansted agreement to account for up to 25% of this growth. This implies that Stansted will account for a little more than seven million additional Ryanair passengers over this time frame, taking its Stansted total from roughly 13 million in 2012 to more than 20 million passengers within five years, rather than over the full 10 years of the agreement. This is at odds with MAG’s press release, which says that Ryanair’s passenger numbers will grow to more than 18 million by 2018 and then to nearly 21 million by 2023. The scenario described in MAG’s press release implies annual growth of 4%-5% over the whole period (6% per annum in the first five years and 3% per annum in the second five years). This looks readily achievable without very heavy fare discounting, on the assumption that market growth is in the region of 4% per annum in the intra-European air passenger market and given Ryanair’s significant average fare discount versus competitors. This scenario is based on the limited amount of extra detail provided by MAG relative to that provided by Ryanair. The other possible scenario, based on our reading of what Ryanair has announced, equates to annual growth of more than 8% over the first five years and does not say anything about the second five years. Perhaps there is flexibility for Ryanair to reach the targets early and to receive a greater discount. An initial growth rate of more than 8% would seem to require a greater level of discounting in order to stimulate demand. Ryanair has a good track record of only doing deals if it can execute them profitably. If this second scenario is the correct one, or is an alternative one, it is reasonable to assume that Ryanair believes that the lower fees obtained from MAG will more than compensate for any likely fare discounts. To add some context from the recent history of Ryanair at Stansted, in the period 2002 to 2007, Ryanair’s passenger numbers at the airport grew at a rate of around 10% per annum. Stansted’s tariffs were much lower during that period (its aeronautical yield per passenger was around GBP3 then, compared with a figure approaching GBP8 in 2012) and Ryanair’s average fares were falling substantially in the first two years of the period. Ryanair was achieving operating margins in excess of 20% back then, compared with its lower, but still very healthy, margins in the mid teens more recently. This historical context suggests that both scenarios may be achievable. Cutting fares clearly stimulates traffic, but it is not the only way to grow traffic. They may be necessary to stimulate demand for additional capacity on existing routes, although increasing frequencies and improving the schedule (particularly around peak hours) may also increase demand, particularly from business travellers. Remember, too, that Ryanair already has much lower fares than its competitors. With regard to new routes, some may need heavy discounting initially if they are genuinely new, but routes that have been served in the past, or that are served by other airlines from other airports at higher fares may not need to dilute Ryanair’s average fares at all. Routes that have been served by higher fare carriers from other airports and discontinued as part of capacity cuts also fall into this latter category. It seems no coincidence that Ryanair has also recently been making a lot of noise about improving its customer interface and trying to catch up with easyJet in attracting business passengers. With clear and fairly ambitious passenger targets set, it makes sense to consider ways to attract, and to retain, passengers other than the offer of low fares. If it can find ways to keep the benefit of cost reductions at Stansted, rather than pass them entirely to passengers, so much the better. This bout of navel-gazing by Ryanair probably does not mark a radical change of direction. Ryanair’s competitive advantage will remain its low cost base, enabling it to charge the lowest average fares in Europe, but it is worth exploring low-cost/no cost methods of widening its appeal. We will separately look into recent initiatives in this area in a later report. Ryanair and Aer Lingus: will the UK CC’s order bring down the curtain on this Irish farce?